This year the pack will be attending Kiwanis for summer camp. The options for each rank are listed below. Payments will be collected this Thursday, April 19th, from 6:30-8:00pm, and next Tuesday, April 24th, from 6:30-8:00pm at Dunn Bros in Hugo. If you cannot make it at either of those times, but would still like to attend summer camp, please email me at pack9151@gmail.com to make other arrangements. CURRENT LIONS: For this year's Lion Cubs, there are two options for summer camp. The first option is Tiger Den Days at Kiwanis Scout Camp. The date that the pack has chosen to attend is July 20th. If you attended Fall Festival or Polar Cubs, this camp will be similar to those programs. It's strictly a day camp where the boys can participate in the activities in the camp, as well as work on some of their achievements that will count towards their Tiger rank. The required ratio is 1 adult to 1 scout - so each scout must have a parent or other adult attend the camp with them. Cost of this camp is $30 for the scout, and $10 for the adult ($40 total). The second option for Lion Cubs is Cub Resident Camp at Kiwanis Scout Camp. This is a full weekend camp that the pack is planning on attending the weekend of July 27th-29th. The boys will be grouped with other boys their age, and participate in age appropriate activities (crafts & skills, aquatics, nature, shooting sports, barn program, flags, and campfires). Just like Tiger Den Days, the required ratio is 1 adult to 1 scout - so each scout must have a parent or other adult attend the camp with them. Cost of this camp is $98/person ($196 total for scout and adult). 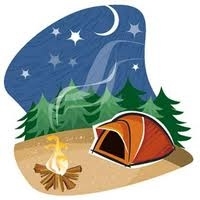 CURRENT TIGERS: Tigers can attend Cub Resident Camp at Kiwanis Scout Camp. This is a full weekend camp that the pack is planning on attending the weekend of July 27th-29th. The boys will be grouped with other boys their age, and participate in age appropriate activities (crafts & skills, aquatics, nature, shooting sports, barn program, flags, and campfires). Some of the activities will satisfy requirements for the scout's Wolf rank. The required ratio is 1 adult to 1 scout - so each scout must have a parent or other adult attend the camp with them. Cost of this camp is $98/person ($196 total for scout and adult). CURRENT WOLVES: Wolves can attend Cub Resident Camp at Kiwanis Scout Camp. This is a full weekend camp that the pack is planning on attending the weekend of July 27th-29th. The boys will be grouped with other boys their age, and participate in age appropriate activities (crafts & skills, aquatics, nature, shooting sports, barn program, flags, and campfires). Some of the activities will satisfy requirements for the scout's Bear rank. Cost of this camp is $98/person ($196 total for scout and adult). CURRENT BEARS: Bears have three options for summer camp. The first and second options are Cub Resident Camp at Kiwanis Scout Camp. This is a full weekend camp that the pack is planning on attending the weekend of July 27th-29th. The boys will be grouped with other boys their age, and participate in age appropriate activities (crafts & skills, aquatics, nature, shooting sports, barn program, flags, and campfires). Some of the activities will satisfy requirements for the scout's Webelos rank. The required ratio is 1 adult to 1 scout - so each scout must have a parent or other adult attend the camp with them. Cost of this camp is $98/person ($196 total for scout and adult). The second option is Cub Resident Camp plus Outpost. The Outpost option adds an extra day of activities to the resident camp schedule, so the camp will run from July 27th-30th. Scouts and parents pack what they need for the night and hike up Mt. Kiwanis to set up camp. The boys will work on additional scout skills as well as perform a service project. The cost for resident camp plus outpost is $133/person ($266 for parent and scout). The third option for Bear scouts is Webelo Adventure Days at Philippo and/or Stearns Scout Camp. This is a day camp where the scouts can work on specific activity badges. The pack has not set a date to attend any of these camps, but if you are interested in this camp, please let us know. The cost for these camps is $30 for the scout, and $10 for the parent ($40 total). CURRENT WEBELOS: As a Webelos Den, we are planning on attending Navajo summer camp at Tomahawk Scout Reservation from August 11-13 (or 14). This camp will give the boys a taste of what it's like to be in boy scouts. There are two options – the regular camp weekend, and the regular weekend plus an extra day for outpost camp. To attend the regular camp weekend (August 11-13), the cost is $107/person ($214 for parent and scout). To attend the regular camp with the extra day of outpost camp (August 11- 14), the cost is $142/person ($284 for parent and scout). If you have any questions about the camps, payments, etc., please let me know! There is financial help avaliable through the council and the pack if funds are an issue.